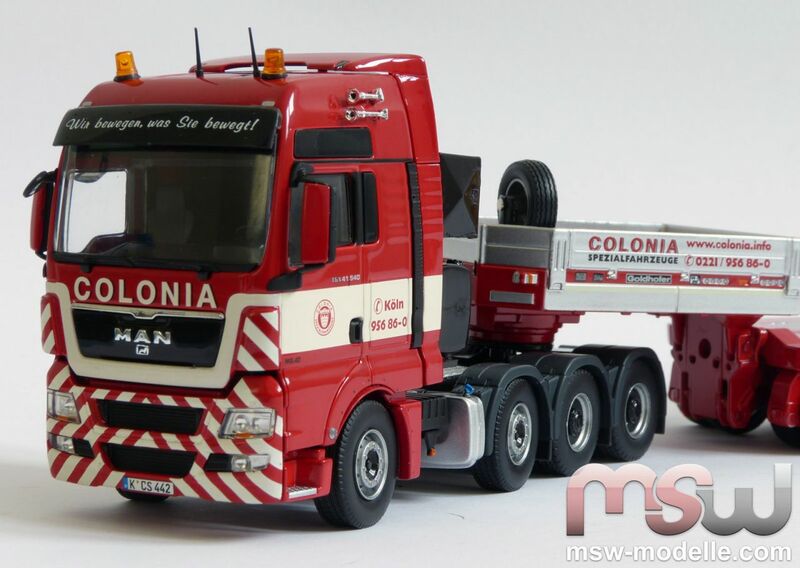 Norbert Mietz created another fascinating die cast model in his famous Exclusiv-series, which is a perfect addition tot he existing Colonia models, as for example the Colonia cranes LTM 1200 oder LTC1045. 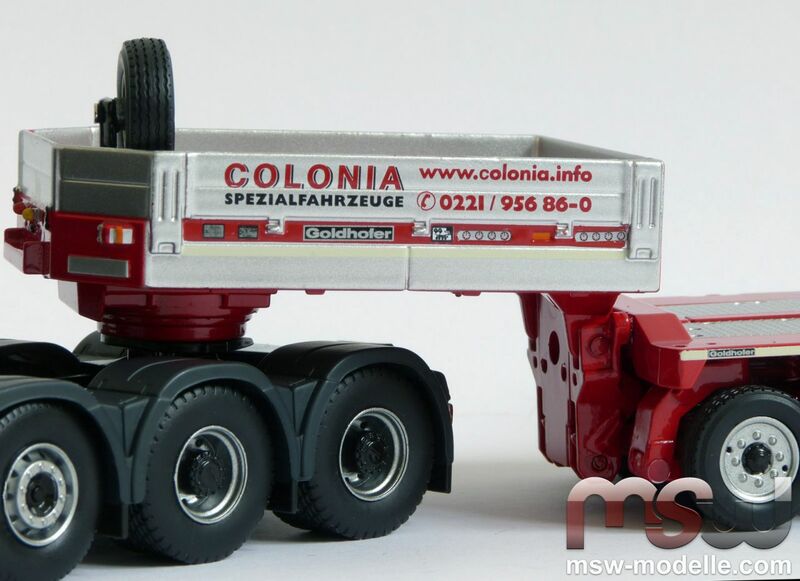 To celebrate the 70th company anniversary of Colonia Spezialfahrzeuge MSW Modelle exclusively presents the Goldhofer flatbed trailer with MAN truck, made by Tekno. Details and functionality are awsome on this nice truck combination. The set is delivered with a 3-axle and 5-acxle module and a MAN TGX truck. 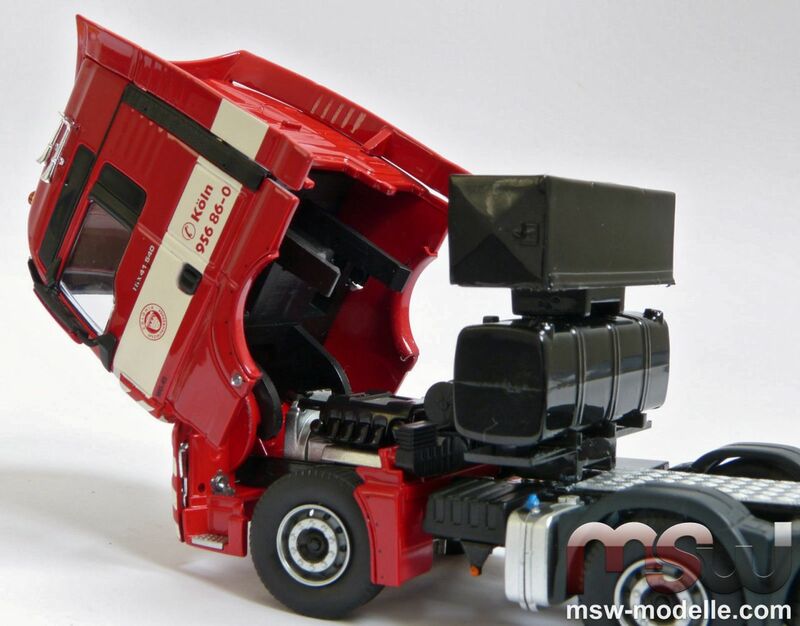 Tekno copied the real machine perfectly with amazing details. A Liebherr R960 excavator can be used to display with load. 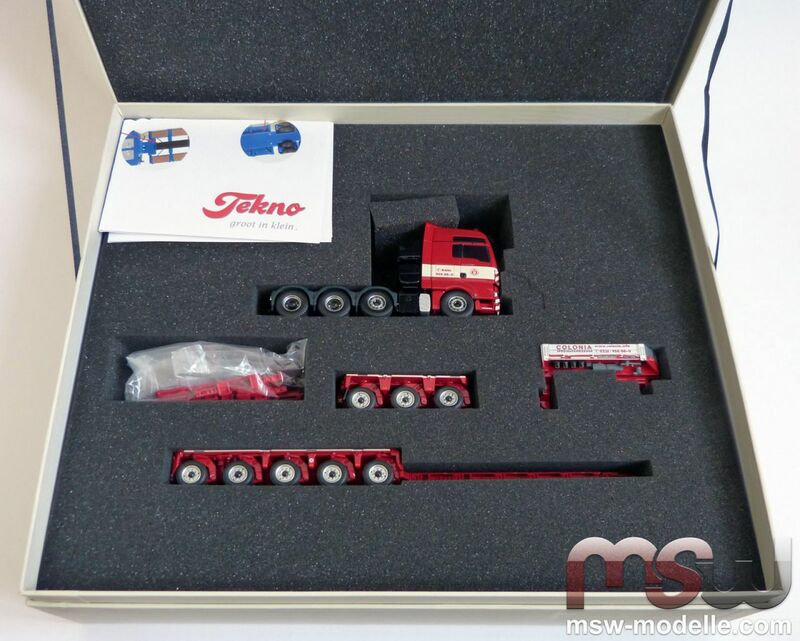 Access and dThe set is delivered with a 3-axle and 5-acxle module and a MAN TGX truck. Tekno copied the real machine perfectly with amazing details. A Liebherr R960 excavator can be used to display with load.ecals are perfectly realized, as well as mirrors, lightings and warning lights. Mirrors, antennas and signal horns need to be attached from the accessories bag. Another nicely done decals can be seen on the gooseneck with warning signs and Colonia’s company information. Assembling the components requires a little intuition, since a small screw connects the 3-axle module with the gooseneck; Tekno supplies the required screwdriver in the accessory bags. And, the trailer can be shown also without the 3-axle module. Small warning signs are attached to the module for oversized loads. Even small hydraulic lines are realized. 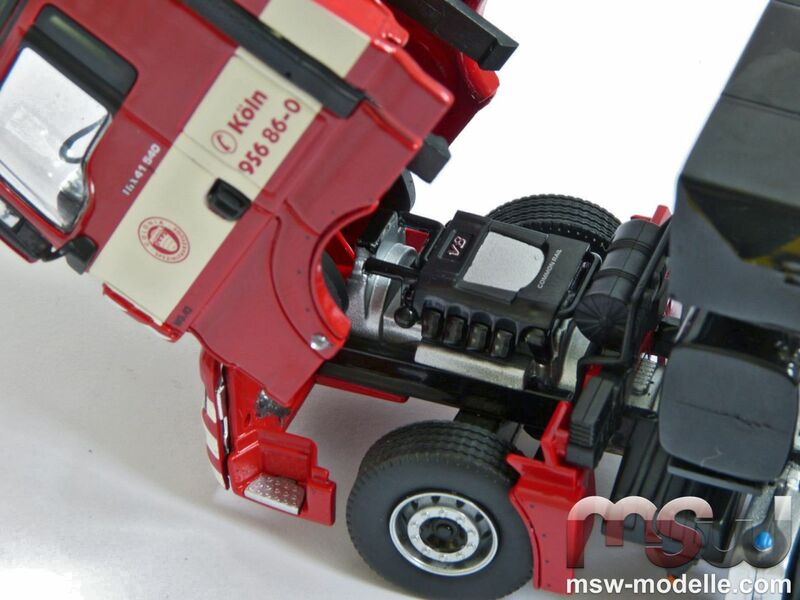 The trucks cab can be tilted to the front for servicing the engine. Behind the cab the heavy duty tower can be seen; which is equipped with an additional tank. Connection lines from truck to the gooseneck are realized as well. When the cab is tilted, the nicely decorated engine can be seen. 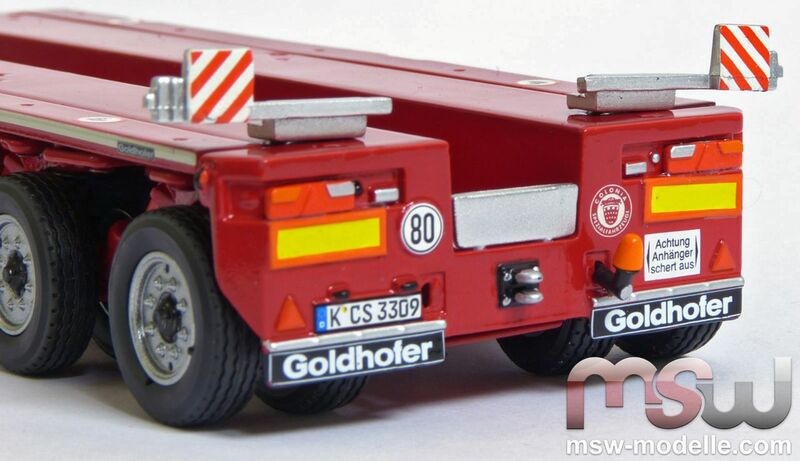 On both sides of the modules small lashing eyes are indicated as well as the Goldhofer brand name. Authentic tire rims and even the dirt protection behind the last axle of the 3-axle module are not missing. In between the modules the flatbed is located. Tekno provides a lot of accessories for different display options. 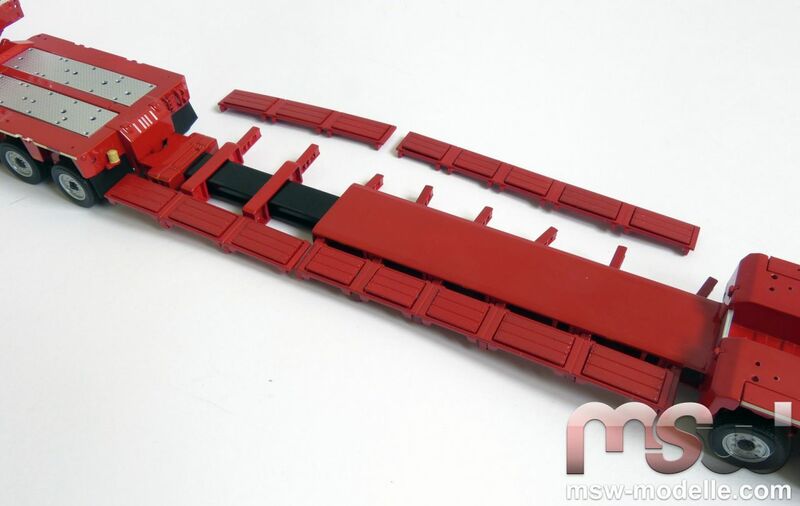 With these additional parts the flatbed can be changed into a loading bridge easily; this would be required to transport wheel loaders for example. Small plastic parts are attached to the flatbed for a wider loading bridge. 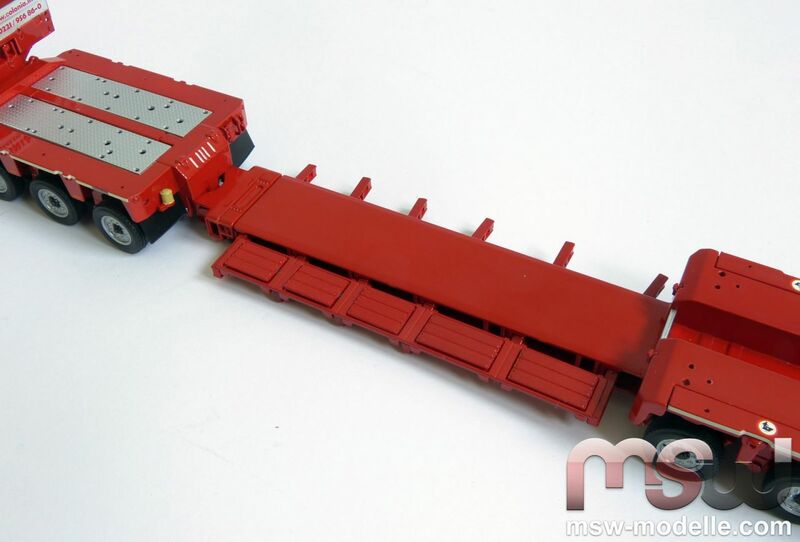 Another interesting feature is the flatbed itself since it can be extended for very long loads. The accessory bag consists all elements to also create the loading bridge extended. 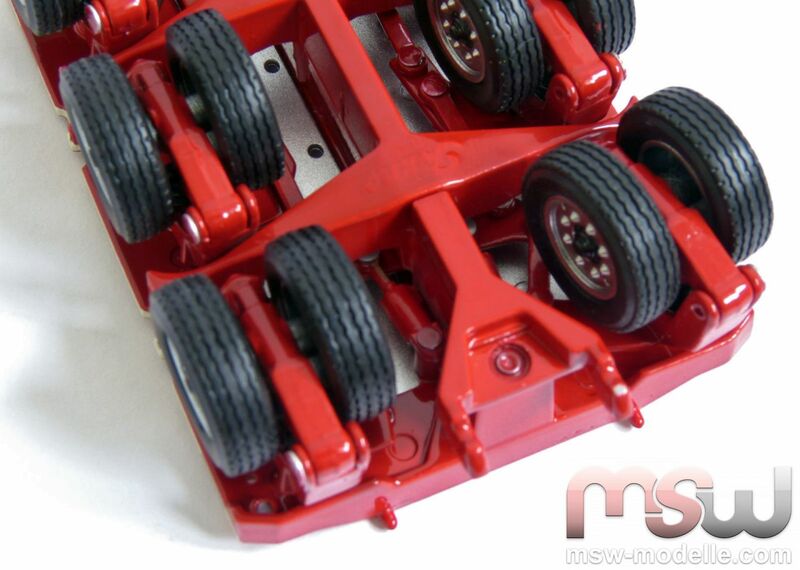 All axles of the modules are also convincing since they feature an excellent steering mechanism with sufficient steering angle and are spring loaded as well; which can be shown when applying little pressure on the modules. The axles – as shown here on the 3-axle module – are connected with small steering rods. And even the small steering cylinder is not missing. Also the backwards decals are convincing. The tag plate is originally copied and the warning signs exist as well. Warning lights and warning markings for oversized loads complete the details here. 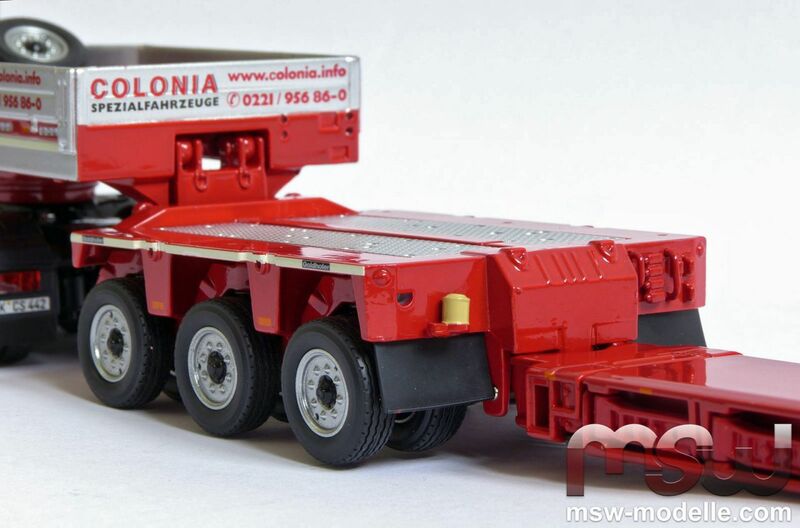 This set is delivered in a precious box and convinces with great functionality and details in the unique colors of the well known crane rental company Colonia from Cologne. The set is perfectly protected by foam. A small manual eases the assembly process. 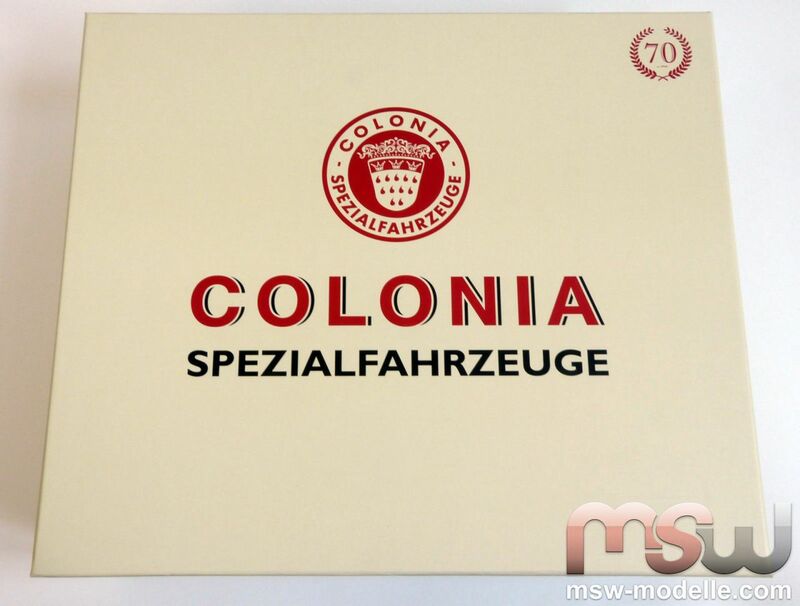 And also the box cover shows the Tekno, Colonia and MSW brand logos. Did you like this review or do you have any comments or suggestions?